Ukrop’s Homestyle Foods of Richmond, Va., is recalling approximately 18,296 pounds of ready-to-eat meat and poultry deli-sliced products. 5.03 lbs. in clear plastic rectangular containers of “Roasted Turkey and Bacon Wrap 4CT Tray,” with a Sell By date from 9/17/18 – 10/06/18. 13.5 oz. in clear plastic rectangular containers of “Ukrop's Buffalo-Style Chicken Wrap,” with a Sell By date from 9/17/18 - 10/06/18. 13.5 oz. in clear plastic rectangular containers of “Ukrop's Turkey & Bacon Cobb Wrap,” with a Sell By date from 9/17/18 - 10/06/18. 42.5 oz. in clear plastic rectangular containers of “Ukrop's Meat & Cheese Tray,” with a Sell By date from 9/19/18 – 10/08/18. 9.75 oz. in clear plastic rectangular containers of “Ukrop's Roasted Turkey & Colby Jack Pinwheels,” with a Sell By date from 9/17/18 - 10/06/18. 9.95 oz. 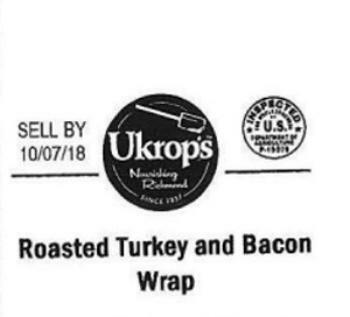 in clear plastic rectangular containers of “Ukrop's Roasted Turkey and Bacon Wrap,” with a Sell By date from 9/17/18 - 10/06/18. 9.25 oz. in clear plastic rectangular containers of “Ukrop's Angus Roast Beef & Cheddar Pinwheels,” with a Sell By date from 9/17/18 - 10/06/18. 9.25 oz. in clear plastic rectangular containers of “Ukrop's Black Forest Ham & Provolone Pinwheels,” with a Sell By date from 9/17/18 – 10/06/18. 12.6 oz. in clear plastic rectangular containers of “Ukrop’s Chef Salad,” with a Sell By date from 9/17/18 - 10/07/18. 4.8 lbs. in clear plastic rectangular containers of “Combo Wrap Turkey & Bacon, Chicken Ceasar, Buffalo Style Chicken, & Veg,” with a Sell By date from 9/17/18 - 10/06/18. 43 oz. in clear plastic rectangular containers of “Ukrop's Honey Turkey & Honey Ham Pinwheel Tray,” with a Sell By date from 9/17/18 - 10/06/18. 8.1 oz. in clear plastic rectangular containers of “Ukrop's Italian Style Pinwheels,” with a Sell By date from 9/17/18 - 10/06/18. The recalled products, bearing establishment number “EST.19979” inside the USDA mark of inspection, were shipped to retail locations in Kentucky, Ohio, Tennessee, Virginia and West Virginia. Consumers with questions regarding the recall may contact Susan Rowe at Ukrop’s, at (804) 340-3104.